King County Metro has decided to make a major purchase of battery-powered electric buses, after an apparently successful test of a few vehicles on Bellevue-area routes last year. King County Metro will buy more than 100 battery-powered electric buses, following what officials called a successful test in Bellevue last year. These buses connect to an overhead docking station to recharge their batteries. Three vehicles have been operating since February, between e-fueling stops at the Eastgate Transit Center. Deliveries of the zero-emission vehicles, from multiple suppliers, are expected to total 20 by 2018 and exceed 100 by 2020, said Metropolitan King County Councilmember Rod Dembowski of North Seattle. Most will be short, 40-foot buses that recharge in minutes, but a few are experimental buses that charge over several hours and have a longer range, he said. Details about the “major purchase” are to be announced Tuesday, says a news-media advisory by County Executive Dow Constantine. The first group of buses would arrive this year. 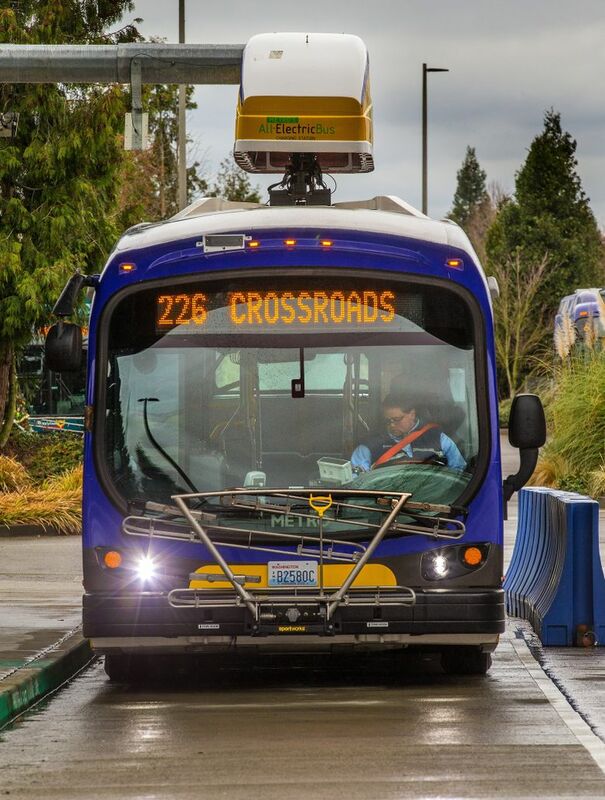 Battery-powered buses currently serve routes 226 and 241, including trips to the Microsoft campus at Overlake. 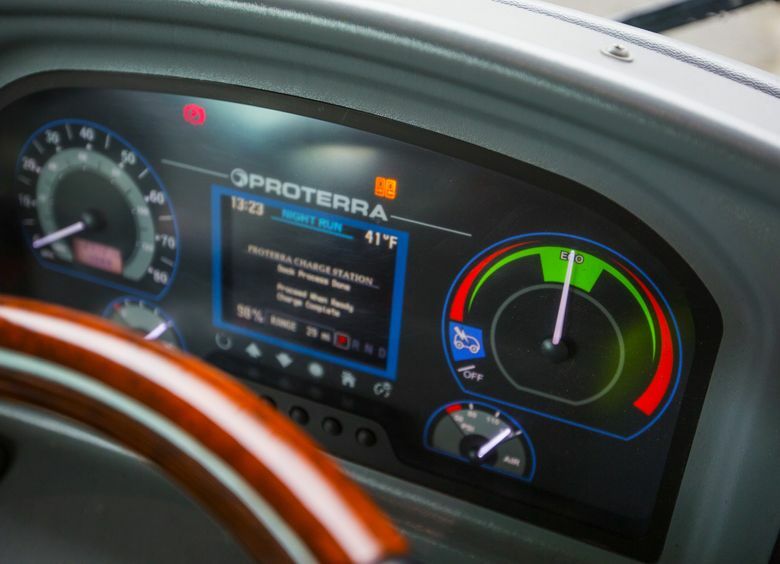 The buses by California-based Proterra require about 10 minutes to recharge for a 23-mile range. The order being announced Tuesday would be the largest battery-powered bus fleet in the country, Dembowski said. The county expects to spend $30 million for its share of the new vehicles and charging stations, according to the recently approved budget. The Federal Transit Administration offers to cover 80 to 85 percent of the cost for zero-emission buses, an incentive for local agencies to modernize. Pierce Transit, Everett Transit and the Wenatchee area’s Link Transit have each won federal grants to buy their first few battery buses soon. King County’s use of battery-powered buses would remain limited until the technology advances. The majority of its buses are 60-foot articulated models with 55 seats and the capacity to carry 80 to 90 riders — but 60-foot battery buses aren’t available yet. Those would be required for Metro to someday offer zero-emission service on RapidRide and long-distance suburban routes. Neighborhoods will benefit, Dembowski argues, because battery-powered buses are quieter and lighter than hybrids and cause less pavement damage. South Seattle, including the polluted Duwamish, Georgetown and South Park areas, would be top priority for new buses that don’t spew particulates, he said. And in a more upscale area, battery buses would fit better on Route 62, which meanders into residential areas above Sand Point — in Dembowski’s district. These new-generation buses differ from the familiar trolleybuses that run on wire through parts of downtown Seattle and hilly central-city neighborhoods. Metro is in the midst of replacing its old trolleybuses with 174 new models that are painted purple. Such comparisons raise the question, did the county make a strategic blunder in 2015 by purchasing wire-dependent trolleybuses, rather than wait for wireless, battery-powered vehicles? Dembowski said the trolleybus order took years to plan and execute, at a time when the old trolleybuses were worn out. Dembowski also said diversity in the fleet is a good thing. “We’re not going to change what’s working,” he said. Metro has about 1,400 buses in its fleet. Last April, the King County Council asked Metro to examine ways of reaching “zero emissions or carbon-neutral” operations. Dembowski, who co-sponsored the proposal with Jeanne Kohl-Welles of northwest Seattle, mentioned “global climate change, including the rapid melting of the West Antarctic ice sheet,” as reasons to act. Hybrid buses release 2 kilograms of CO2 per hour, the county says. Of course, emissions from the Puget Sound area represent a fraction of global carbon, so Metro’s action doesn’t move the thermometer. On the other hand, U.S. and Chinese officials declared a “race to zero emissions” in 2016. And a decade ago, companies like GM, Cummins and New Flyer leveraged Metro’s order for 500 hybrids, to recruit other transit clients. King County’s longstanding goal, dating back to former Executive Ron Sims in the mid-2000s, is to acquire the nation’s greenest fleet, by making all vehicles hybrid or cleaner. About 70 percent meet that standard now. Meanwhile, the Seattle Department of Transportation designed streetcars on its new First Hill line to retract their poles and run on battery power for short stretches, avoiding interference with webs of trolleybus wires at busy crossings.